The Mean Girls musical, with a book by Tina Fey, is based on her 2004 teen film. It stays close to its source text in which a home-schooled teen girl must navigate the wilds of an American high school. The more preachy or saccharine elements of this coming-of-age tale are mostly balanced out by Fey’s incisive comedy. Most importantly, the musical retains the film’s cake-eating and having ability to so closely resemble the teen movie it on one level lovingly parodies, while injecting a fairly simple, but astute, funny—and yes, feminist—critique. As in the film, 16-year-old Cady Heron (Erika Henningsen) and her geologist parents return from Kenya to America. Cady finds herself enrolled in her first American high school. There she entangles herself with “apex predator,” queen bee, and leader of the high school’s power clique, the “Plastics,” Regina George (Taylor Louderman). However, in departure from the film, the outsider characters, Janis and Damian (Barrett Wilbert Weed and Grey Henson), narrate us in and out of the show; they are, in a way, empathetic alter egos for the audience despite falling into the background somewhat in the center of the musical. Old favorites from the film are there, with only the occasional and judicious tweak. Topical barbs are added (Russia and sexual assault both get a mention), but with wise restraint. They are more appreciatively received for not being strewn throughout in a desperate search for contemporary relevance. Despite the addition of smart phones and social media, the show even keeps its early 2000s vibe. What originally set the film apart from more trivial teen movie fare is that it managed to expose the teenage “bitchiness,” too frequently treated as an innate female trait, as a product of an altogether sexist culture. This carries through to the musical, which even manages to sling a few arrows in the direction of the so-called “girl power” brand of feminism. On a small level too, Mean Girls needles at our own complicity in prejudice. One-liners are funny the first time you hear them (Janis: “This is Damian. He’s almost too gay to function”), but troubling in a different context (“That’s only okay when I say it”). These are the moments when the musical is at its best. They almost—though not quite—make up for the rather gooey teachable bits also delivered that offer a simplified morality—a flaw that the Broadway musical genre quite possibly exacerbates. Despite being the central character, Cady is perhaps the least interesting of the core roles. It is hard to fault Henningsen (although in terms of the character’s age, the casting team have traded Broadway chops for teen believability). Weed and Henson have a great rapport with each other and the audience. Weed provides acerbic wit (and some powerful lungs), while Henson as Damian offers musical theater in-jokes, adopting a range of recognizable musical genres in his numbers. Louderman is on point as queen bee. She draws out her sung self-introduction—“My name is Regina George / And I am a massive deal”—with deliciously icy self-importance and finds the essential balance of chill and charm. Rockwell as Karen is delightfully empty-headed—a constant smile on her Barbie face, she verges on idiot savant—and has the audience eating out of her hand. But it is Ashley Park as second-fiddle of the Plastics, Gretchen Wieners, who very nearly steals the show. There aren’t many performers who could pack so much into a nervously peppy, close-mouthed, half-giggling, “ahhmmm.” Her moments of panic when she fears she may have mis-stepped are hilarious and heartbreaking, as is her brilliant rendition of “What’s Wrong With Me?” Park is one of the strongest singers here, and she shows off some admirable dancing skills too. Indeed, between the music, lyrics, stage design, and choreography, the dancing is the strongest component. Director and choreographer Casey Nicholaw has his energetic ensemble melding classic kick-lines with some fantastic cafeteria lunch tray moves. However, the inclusion of men in female costume in a couple of numbers towards the end is jarring. Possibly its an attempt to get more bodies on stage or to enable a couple of moves requiring a certain physical strength. Maybe from a distance this gambit works, but with proximity this overdone imitation of feminine affect meant that this plays as over-accentuated drag. It was out of place and almost vaguely insulting in a show with themes such as this. Aside from this misstep, Nicholaw shows a clear hand in both the choreography and his overall direction. The energy and visual impact injected by the dance numbers sets the pace for the effective video design (by Finn Ross and Adam Young). Having projections act as set design can be a lazy move, but here it is justified. The design scheme (by Scott Pask) complements the physical work of the ensemble, who deftly swivel school chairs and flats in and out. The video echoes their swift stage movement in a way that almost replicates the effect of rapid scene shifts on film and evokes the disorienting nature of a new school. Costume design by Gregg Barnes is also spot on. Ms. Norbury’s outfit of skinny jeans and blazer is indeed the uniform of nerdy-cool young women educators everywhere. While the teen outfits may not be as true to what actually fashionable teenagers would wear, they work well to convey character and contribute to that early 2000s feel in the bright, slightly exaggerated style appropriate to the genre. The music by Jeff Richmond unfortunately is largely inoffensive, but forgettable. Several numbers have potential. “Where Do You Belong?”, “What’s Wrong With Me,” and “I’d Rather Be Me” have a stronger sense of character and move the impulse of the show forward. But most numbers get a little lost. The score would benefit from fewer songs with more distinct musical and lyrical identities—it needs at least one or two truly standout numbers which it currently lacks. 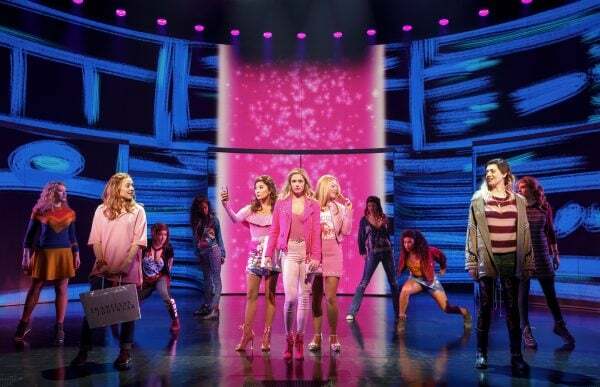 Even if it is unlikely that anyone will be humming tunes from Mean Girls, this production proves again that the Broadway musical is an excellent medium for the adaptation of a certain type of film—tongue-in-cheek, youthful, a little sweet, a little sharp, and legitimately funny. Thanks in large part to a talented, well-directed cast and strong design team, Mean Girls generally delivers on those characteristics. Ironically enough for a show that melds two now highly nostalgic and referential genres—the high school movie and the Broadway musical—the admittedly sugar-coated critique that underpins Mean Girls has kept its timeliness too. Cast includes Erika Henningsen, Taylor Louderman, Ashley Park, Kate Rockwell, Barrett Wilbert Weed, Grey Henson, Kerry Butler, Kyle Selig, Cheech Manohar, and Rick Younger.